With a backdrop of supposedly happy killer whales swimming in their tank, SeaWorld Parks & Entertainment President Jim Atchison said that Tilikum, the orca who killed trainer Dawn Brancheau on Wednesday, would not be subject to punishment. During a press conference at the Orlando SeaWorld Friday, Atchison was asked about the three deaths that involved Tilikum and the judgment to put SeaWorld workers in the water with a killer whale that has killed. "The events are quite varied," Atchison said. "Those incidents and nature of them had nothing to do with the nature of this event ... and are not relevant to his particular altercation." He did not elaborate on how the three killing incidents varied. The whale, along with two female killer whales drowned Keltie Byrne, a trainer, in 1991 at a British Columbia park. And in 1999, Tilikum killed a man who had sneaked into the SeaWorld tank after hours to swim with whales. He was asked about videotapes related to the event, and said some existed but he could not share any information about them, as they are part of an ongoing investigation. Atchison said that Tilikum is "an important part of the overall team," and is "part of a social network with other killer whales and trainers." Tilikum will continue to be a part of SeaWorld shows, Atchison said. "His participation in shows is an important part of overall husbandry," he added. He defended the orca exhibits and shows at SeaWorld as an "extraordinary way for people to make connections with marine animals." As a member of the SeaWorld team, Tilikum is praised for his size and large splashes that entertain customers. He is allowed to socialize with the eight other whales at SeaWorld Orlando and his sperm is used to impregnate female orcas, adding to the stock of performing whales. "He is a very special animal that requires very special handing," Atchison said. As part of the special handling, a review of orca management procedure is underway with a panel of experts, Atchison said. The show will go on, but trainers will not be allowed in the water with the orcas until the review is completed. "We will move in a cautious way as we need to make sure it won't happen again," he said. Before Wednesday's attack, Shamu was the whale most people associated with SeaWorld, entertaining 13 million people a year at all three parks, reports CBS News Correspondent Mark Strassmann. The whale show proved to be a commercial success, but critics complain it exploits the whales for entertainment. "You take Shamu out of the equation, what's left standing at SeaWorld?" asked Courtney Vail. "You know, beer and the popcorn stand or petting the dolphins and feeding them fish. I don't see the research, I don't see the education, and I certainly don't see the conservation." About the only way to keep humans from suffering the fate of Dawn Brancheau is to keep the species separate. According to Dr. Patrick Hof, a professor of neuroscience at the Mount Sinai School of Medicine who has done research on whale brains, Tilikum lives in an impoverished, foreign environment. 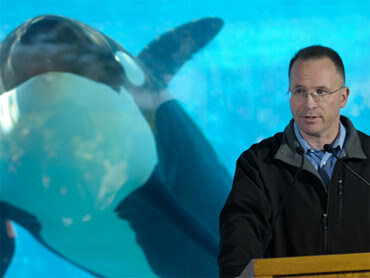 "The setting of SeaWorld is completely foreign to whales," Dr. Hof said. "A killer whale is a predator, a wild animal. Their hunting behavior is well documented, and they can become extremely aggressive." Does Killer Whale Need a Lawyer? What Caused Killer Whale to Attack?